The state of the job market consistently ranks among Americans’ top policy priorities, and access to online resources has long been viewed – by policymakers and the public alike – as an essential tool to help Americans find and apply for jobs. The FCC’s National Broadband Plan cited expanded access to jobs and training as a key benefit of increased broadband adoption, and a 2010 Pew Research Center survey found that two-thirds of Americans believe people without broadband are at a disadvantage when it comes to finding out about job opportunities or learning new career skills. Other studies have found that the internet is especially important to the job seeking habits of certain demographic groups, such as African Americans. This report, based on a nationally representative survey of 2,001 U.S. adults ages 18 and older, documents the current state of digital job seeking in America. It first examines the basic contours of this issue – how many people have looked or applied for a job online, how the internet stacks up to other sources of job information in terms of overall importance, and how confident Americans feel in their own digital job-seeking skills. After that, the report examines the specific role smartphones and social media platforms are playing in Americans’ job seeking habits. Notably, these figures are based on the entire public – many of whom are retired, not in the job market, or have simply not had a reason to look for a job recently. Narrowing the focus to the 34% of Americans who have actually looked for a new job in the last two years, fully 90% of these recent job seekers have ever used the internet to research jobs, and 84% have applied to a job online. 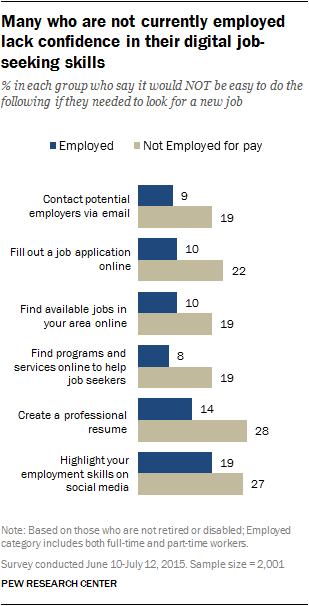 Not surprisingly, young adults are the demographic group most likely to engage in these online job seeking behaviors. Roughly eight-in-ten Americans ages 18 to 29 have researched (83%) as well as applied for a job (79%) online. However, a substantial majority of those ages 30 to 49 (and a sizeable minority of those ages 50 to 64) have engaged in these behaviors as well. Along with these differences related to age, African Americans are more likely than whites to engage in online job-seeking behaviors; urban and suburban residents are more likely to do so than those living in rural areas; and Americans with higher levels of income and educational attainment are more likely to do so than those with lower income and education levels. Clearly, the vast majority of American job seekers have utilized online resources at one time or another to look for and apply for jobs – but the internet is just one resource that job seekers might take advantage of when looking for work. How do online resources stack up to the many other ways of looking for and finding employment, whether online or offline? To examine this question more deeply, the survey asked a series of questions about the resources recent job seekers took advantage of in their most recent search for employment. These findings illustrate that Americans utilize a wide range of resources when looking for work – but online resources, along with personal and professional networks, are especially important when it comes to finding employment in America today. Roughly one-third of Americans (34%) indicate that they have looked for a new job at some point in the last two years, and 79% of these job seekers utilized resources or information they found online as part of their most recent employment search. By comparison, 66% of these recent job seekers turned to personal connections with close friends or family members, 63% turned to professional or work connections, and 55% sought assistance from acquaintances or friends-of-friends. Taken together, 80% of recent job seekers used professional contacts, close personal connections, and/or more distant personal connections in their most recent search for employment – nearly identical to the 79% who used online resources and information. Several other resources are used by a substantial minority of recent job seekers: 32% utilized government or private employment agencies in their most recent job search, 32% utilized ads in print publications, and 28% utilized events such as conferences or job fairs. Job seekers in a range of demographic groups rely heavily on the internet as an employment resource,4 but Americans with high levels of educational attainment are especially likely to do so. Some 88% of college graduates utilized online resources and information as part of their most recent job search, compared with 77% of those who have attended but not graduated from college, and 69% of those who have not attended college at all. Educational attainment has long been a strong predictor of whether or not Americans go online or not, but the differences noted here are not merely the result of higher rates of internet adoption by Americans with relatively high education levels. Even when non-internet users are excluded from this analysis, job seekers who have attended or graduated from college are substantially more likely to rely on online resources compared with job seekers with only a high school education. These better-educated job seekers are also more likely than job seekers with lower education levels to have relied on professional connections (but not close personal connections or friends-of-friends) in their most recent job search. Nearly three-quarters (72%) of college graduates utilized professional connections in their most recent job search, compared with 59% of those who have attended but not graduated from college, and 57% of those who have not attended college at all. Americans today typically incorporate a number of different information sources into their hunt for employment: Fully 52% of recent job seekers indicate that they utilized four or more resources (out of a total of seven) in their most recent employment search, while just 11% indicate that they used only one resource. But although job seekers tend to leave few stones unturned when searching for employment, a small number of resources – including those found online – stand out as being especially important to a large number of Americans. In addition to asking which resources they utilized in any way during their most recent job search, the survey also asked these job seekers to indicate the resource they consider to be the single most important in helping them look for work. 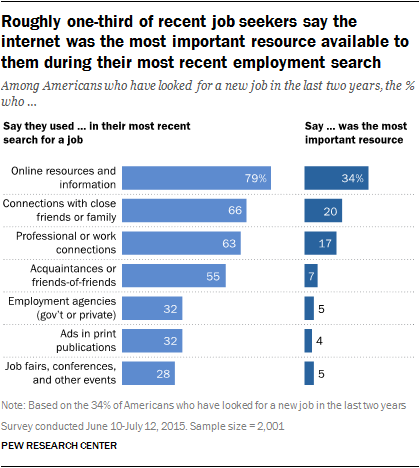 Roughly one-third of job seekers (34%) say resources and information they found online were the most important resource they used in their last job search; 20% cite close personal connections, and 17% cite professional or work contacts as their most important resource. Relatively modest numbers of job seekers point towards other types of resources as their most important source of assistance during their most recent job search: 7% cite connections with acquaintances or friends-of-friends, 5% cite employment agencies, 5% cite events such as job fairs, and 4% cite ads in print publications. There are relatively few demographic differences when it comes to the resources job seekers rely on most heavily when looking for work. Younger job seekers and those who have not attended college were a bit more likely to say personal connections with friends or family members were most important when they were looking for work, while college graduates and older job seekers tend to indicate they relied more heavily on professional or work contacts. As job-related services and information increasingly move online, most Americans feel fairly confident in their ability to navigate various aspects of the digital job hunt. But at the same time, a minority lack confidence in their ability to perform even relatively basic tasks such as emailing potential employers or finding lists of available jobs online. This is especially true among those who have not attended college and those who are not currently employed for pay. Americans who have not attended college also indicate that they would have a particularly difficult time performing many of these tasks. Roughly one-in-five adults with a high school diploma or less indicate that it would not be easy to contact a potential employer via email, find programs online that help job seekers, fill out an online job application, or find lists online of available jobs in their local area. And nearly one-in-three who haven’t attended college indicate that it would be not be easy for them to create a professional resume or use social media to highlight their job skills. In each case, Americans who have attended and/or graduated from college are significantly more comfortable with these aspects of the modern job seeking process.